Your child will probably be in a better mood. Like, much better. Neuroscience researchers have shown that the human mind does a lot of work when we sleep. So, when our kids don’t get enough sleep, their minds don’t get to do all of their important work overnight. A recent study also showed that the mind actually processes things differently when a person is well-rested versus tired, which leads to different emotional reactions when presented with positive, neutral and negative pictures. While the research on this topic shows that our emotions are much more even-keeled when we are better rested, my most helpful and important feedback has come from parents of kids with Special Needs. Moms and Dads that I have worked with report that, once they are on a better sleep schedule, children are much more calm with change and transitions, and much more open to problem-solving, prompting and support when things don’t go as planned. Your child will be more open to, and more successful with, learning. Just like with our emotions, research shows that our kids’ brains are able to put together all of the information they take in every day when they have more sleep. I tend to think of this process as organizing all of the information they experience – with all of their senses all day long – into the virtual file cabinets in their brains. These mental file cabinets can then be opened to access these bits of knowledge again any time our kids come across a particular subject, or a similar one, in future days, months and even years. Without the proper time for our kids’ brains to file information away, they don’t operate at their highest cognitive level. Research has shown that even one hour less than the ideal sleep time for our kids can have negative impacts on their short- and long-term memory, and even their math fluency in school. Caregivers and teachers report children being more alert, and more ready to learn once they are resting well. One mom I worked with declared that more sleep “opened the doors” to learning that she thought may have been permanently closed before her child was sleeping through the night independently. Time Awake = Quality Time! When a child is finally sleeping well (and sometimes this is after months of trying) parents find that their time spent with their kids is much more quality time instead of ‘let’s just get through this minute/hour/day’. Everyone wants to live in one of those idyllic pictures of moms sitting next to kids, relaxing and enjoying a snack, book, or game together, with everyone smiling. This is often not possible when your child is over-tired (and so are you!). When I first start working with a family who wants my support with their child with special needs, they sometimes tell me that they see that their children are so busy all day every day with medical appointments, school, and therapies, that they feel as though they need to spend quality time with their child once everything is done for the day – oftentimes this is between 7 and 9pm – and bedtime starts after that. When we delve below the surface and talk through how “quality” that time of day actually is, many parents tell me that their children cry a lot in the evening, have trouble playing well with siblings or even parents at this time, and many times this window of the day includes a movie or TV show before bedtime starts. Oftentimes when working with families, we do restructure the day with an earlier bedtime. While this means that evening awake time has been shortened, at the end of the process, most of the families with whom I work report that the times when their children are awake is much more “quality” than they have ever had before! One of my mommas even said, “All at once, he is happy, sleeping, and manageable!” – factors which made a huge, positive impact on the family’s life together. Another momma mentioned to me that 12 hours of quality time awake, filled with happiness, smiles, and laughter, is so much better than 14 hours of difficult time spent with her son in frustration with her, or with his other family members. The positive emotional impact is undeniable for so many families, especially those with kids with special needs. All family members get the gift of more peace once children are back on track with their sleep. Some parents I work with are amazed at what a difference it makes to simply be able to sit down with their spouse and enjoy a bite to eat after everyone is asleep before 8:30pm, or even a favorite show on Netflix on a weeknight! Amazing! Working hard to achieve more consistent and supportive sleep for kids with special needs isn’t something that only selfish parents do. Parents I work with realize that the entire day is easier and smoother for everyone once positive sleep patterns and routines are well-established. Because parents and kids are no longer exhausted, frustrations dissipate and there is less conflict in the house altogether. Remember when I said your child would be in a better mood? So will you! 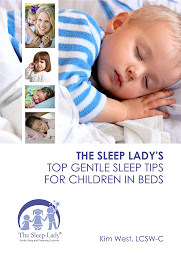 Consistent and supportive sleep is a WIN-WIN for everyone in your family! Click here to receive my 5-point checklist to see if you are ready to start sleep coaching with your child with special needs.